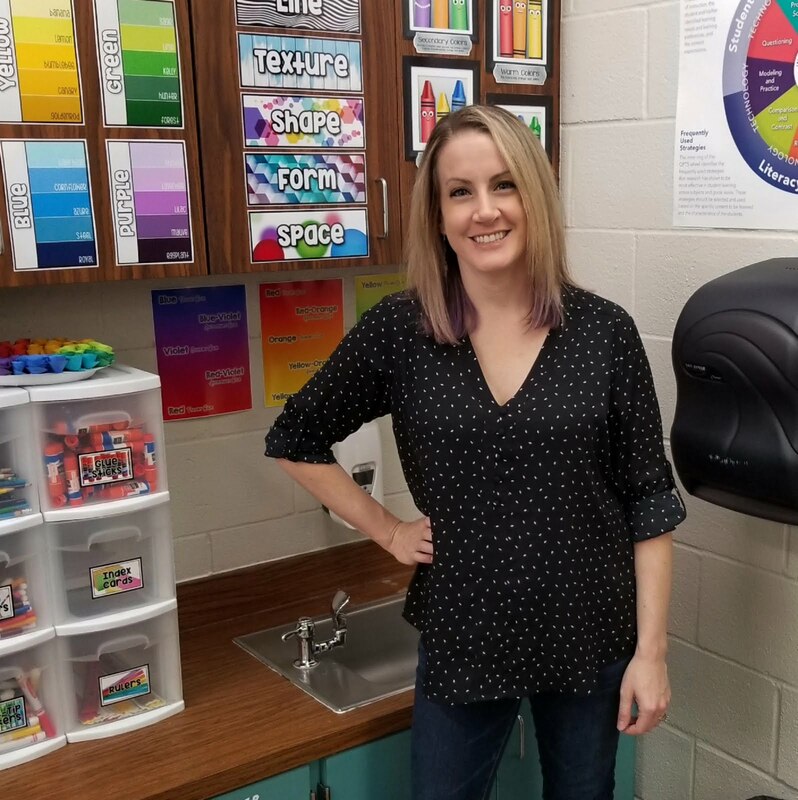 This past week I decided to change my kindergarten lesson plans last minute.. and suddenly found myself in need of 3 one-day lessons to do with my kids. Fortunately I have this wonderful blog and was able to quickly get online to look up some of the projects I did last year with my kinders (that took care of two of them), but I still needed one more -- and it was literally like 5 minutes before class began. So I quickly scoured my room to see what supplies I had readily available in an attempt to put a lesson together. Next to my cutting board I had a giant stack of 6" x 12" light blue construction paper leftover from my birds-eye-view snowman project (we used a piece of 12" x 12" for that) and a giant pile of 4" x 12" white drawing paper leftover from my winter value landscapes (we used a piece of 14" x 12" for that). 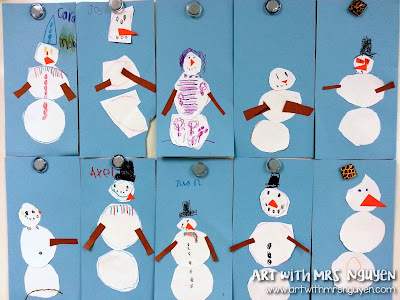 Suddenly it came to me - SNOWMEN! Yay for this time of year! I had a stack of foam cups sitting on my shelf from a 3rd grade lesson I'd been doing the past few weeks and decided that they would be the perfect size for circle tracers for snowballs. 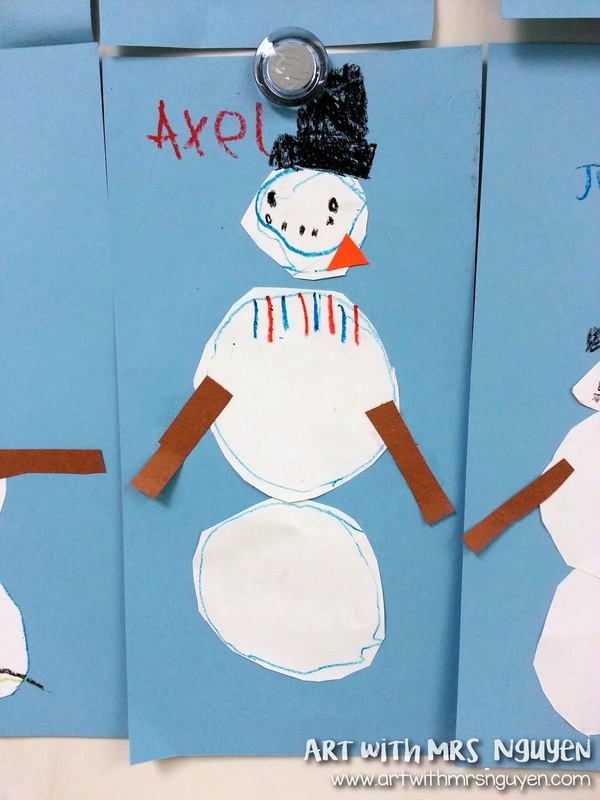 I also had plenty of orange and brown construction paper already cut to size from my birds-eye-view snowmen lesson. 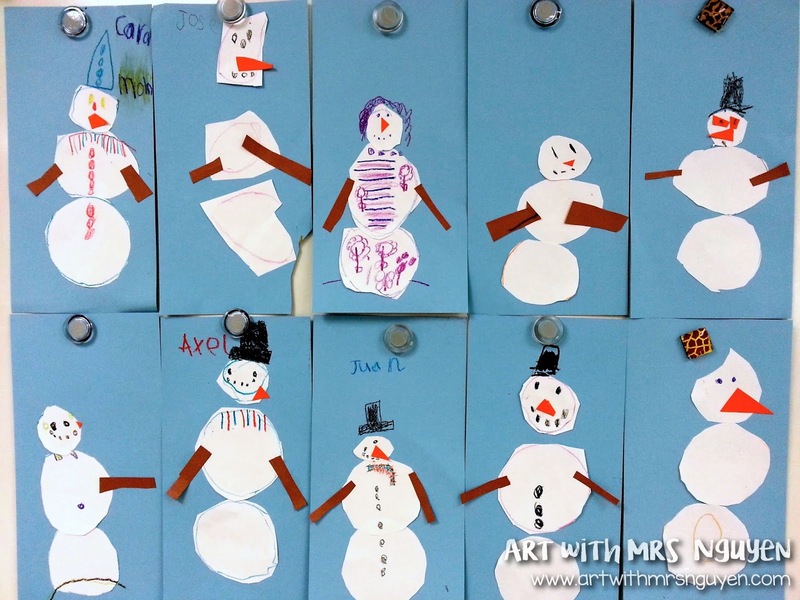 All I needed was something to pull this altogether.. so I walked over to my bookshelf and pulled out the book "Snowballs" by Lois Ehlert. 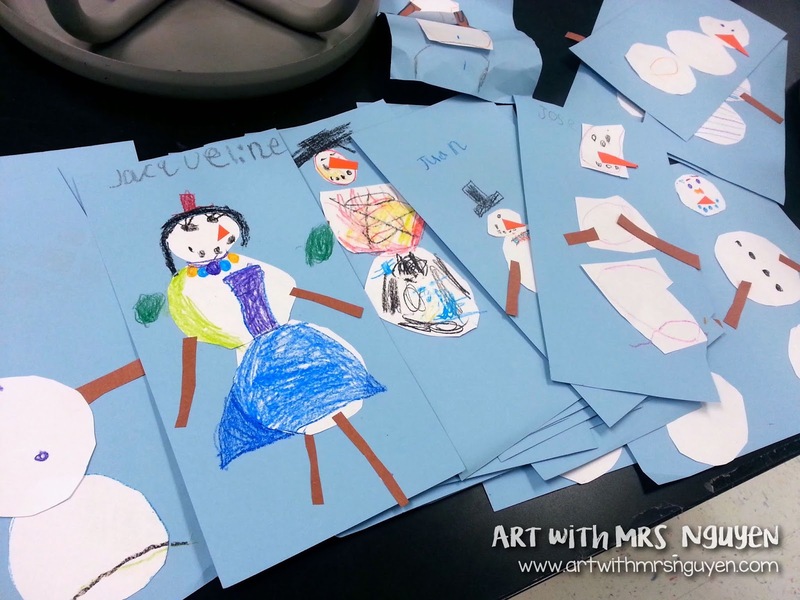 When my kinders walked in we started out at the carpet and read the book "Snowballs." Afterwards we talked about all the different materials the illustrator used to create the snowmen in the book and brainstormed a list of things my kinders thought would be good materials for making a snowman. Since we live in Georgia, many of my kids have never seen enough snow before to even imagine making a snowman.. so this was really interesting to them! We also talked about how the illustrator didn't just create boring snowmen, she created snowmen and snow-women, and snow-animals with personality by adding a lot of unique details! 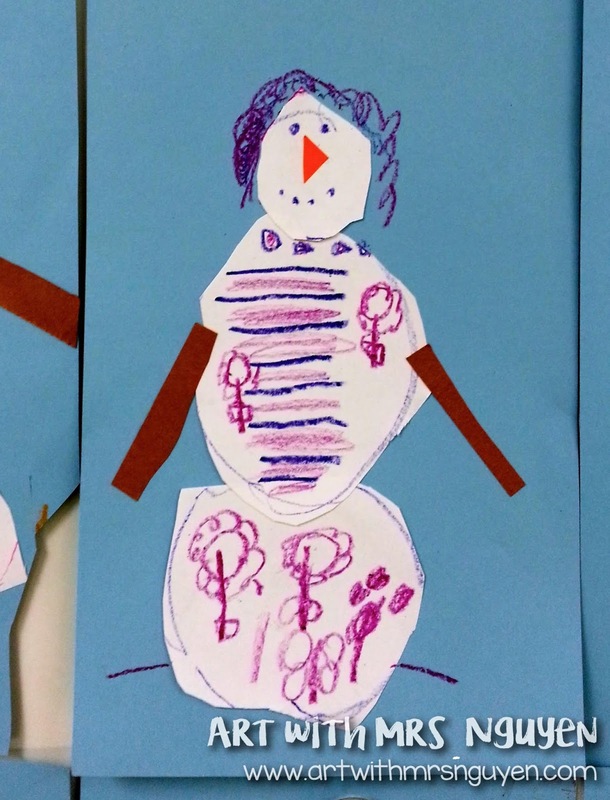 After a quick demo of how to get the project started, I sent my kinders back to their tables to begin creating their own special snow-person! These were about 90% done (didn't want to miss out on getting a picture)!